Good idea Robin, can you gin up a couple ? I'm afraid my computer art/graphics skillz are somewhatb lacking..
Ill make a few and put them up for consideration. This one seems like it could be a lot of fun! Would a de-turreted British Army Stuart fit with the theme? Been thinking about building one provided I can find some decent references. Thanks Angel, I agree. I had never seen it before until I went looking for proof pictures of the smoke generator FT-17. It would make a cool diorama. 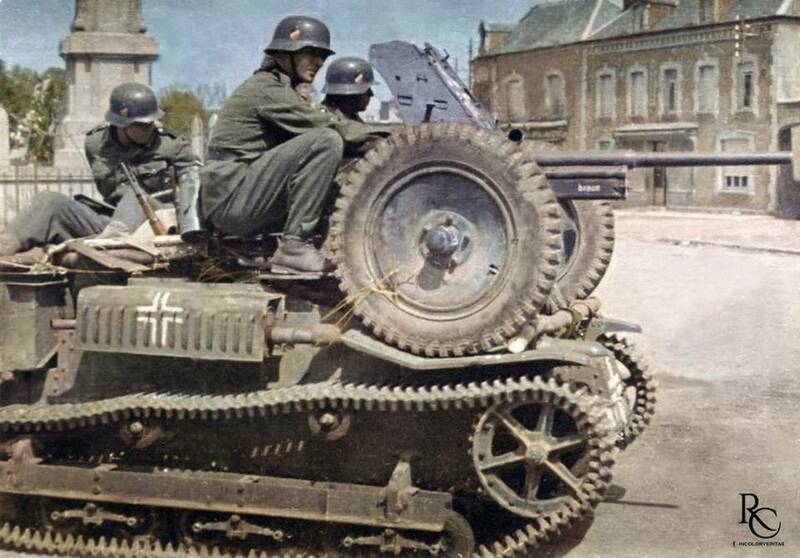 A French tank being used by Polish troops to tow a German gun. Pretty dang cool. Thanks Ko. Looking forward to starting it to see how it builds up. 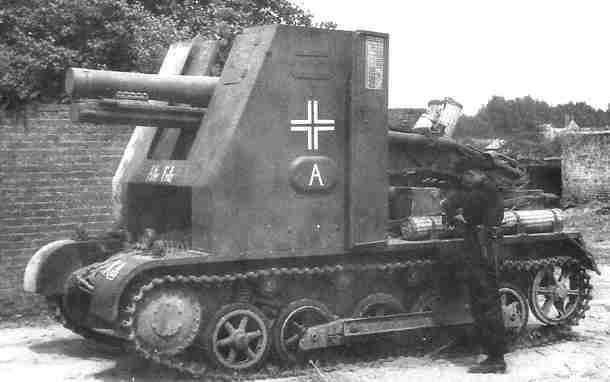 Is 15 cm sIG 33 (Sf) auf Panzerkampfwagen I Ausf B funny enough to be allowed to take part in Funnies Campaign? Yeah, I'd say so. 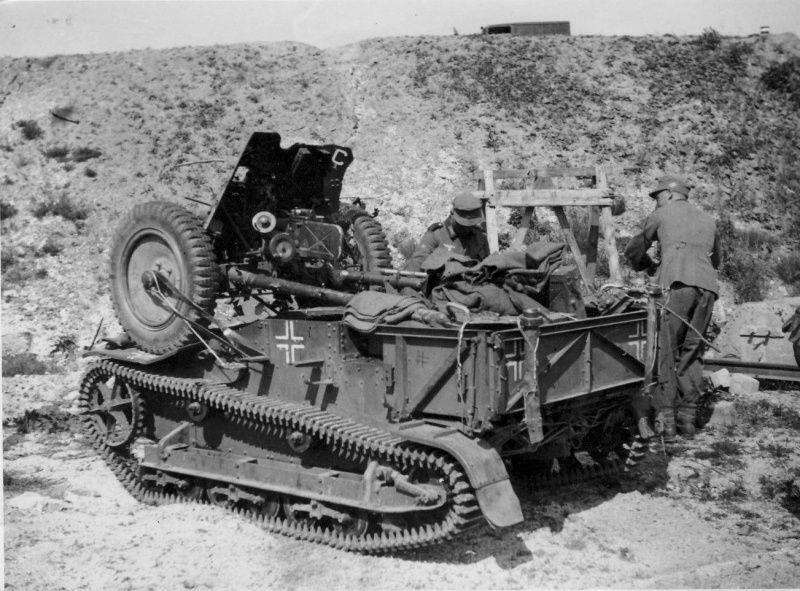 I don't think they ever imagined a Pz.1 carrying that field piece when they first designed it! I have given a lot of thought about images that portray this campaign at a glance, I know the clown face or such jumps to mind. After all my considerations I could only come up with one combination for an image. the colours of the Royal Armoured Corps which I am told stand for 'through the mud and the blood to the green fields beyond' and these colours overlaid with the badge of the 79th Division which is where the term 'Funnies' originates. I mention that I'm going to build Dragons #6440 Bison II for this campaign. I did find 2 major problems when doing research. First is the drive sprocket, it has the wrong teeth count and don't line up with the tracks. The modeler who did a review on the same model. Bought a set of Modelkasten Tracks (SK-60) for Panzer II/Wespe and it solved that problem. Second is the radio stand. Dragon only supplied one spur for one radio and you have to scratch build the 2nd stand. In a review I found. The reviewer does show the stand he build. But He doesnt explain on how he created the stand. My questioned is, Does anyone know an other review on how they build the stand? Hi John. The radio racks were identical. Use the one supplied in the kit as a guide to scratch building the 2nd one from styrene strip. Watch it when you come to the part where the mesh is added. From memory, there is an issue in how the instructions tell you to fit it. Once again and again and again, Petbat comes through! Pet, I was thinking the same thing (after post) when it was time for that step. Now it gives me a reason to take a trip to the hobby store tomorrow. Thanks for the heads up about the mesh issue. I did make a note about it. A Thought for the award. Funnies is also what a comic strip is called, so how about a tank comic strip? Peter the only issue with that is the size limit. What is the size limitation for awards. I know the 50 x 20 pixels visual size, which this fits within, but I am not sure of memory size. My Pc tells me this is 1.68kb is the limit 1.5kb? If I strip out the black at top and bottom, I can get it down to 1.4kb. Will that work? Just for you John.... for discussion purposes of course. excellent! I vote on this one, unless some1 comes up with a better one. Just a Month away Gents! Questions about Dragons Kit 6440 and I quote. "Pawel, that's true. I am building this kit now and the tracks do not fit the sprocket!!! So, one should consider buying aftermarket tracks or find old dragon 25-teeth sprockets." What old dragon kits have 25 teeth sprockets? Hopefully someone knows. I haven't bought the Modelkasten Tracks (SK-60) yet. I might buy some Friulmodel Tracks instead and that brings up the next question. Would Friul ATL30 Tracks for panzer ii and wespe fit the sprocket that came with kit 6440? Finally I get to start a new project in 3 hours and 56 minutes!